Moving north from Fira Town and along its magnificent west coast overlooking the Caldera, this area is within easy walking distance of the capital, with its furthest point being less than one kilometer from it. 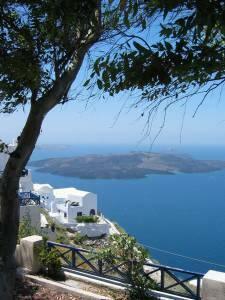 If you’re not interested in walking the average 800 meters, you can always take the bus running between Fira and Oia. Outstanding accommodation, Caldera and volcano views, and easy access to the main town make this an excellent choice for your stay. This small complex of eleven studios and apartments has a beautiful view over the caldera and is within walking distance of Fira Town.